Based in Malvern, Pennsylvania, Accutome is entering its fourth decade in the ophthalmic industry. 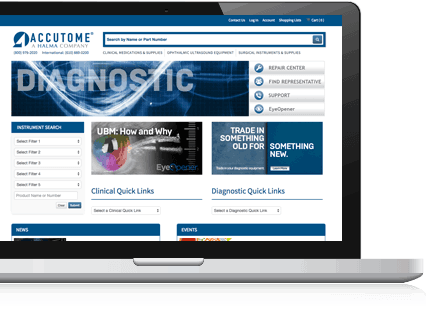 Originally founded as a provider of diamond knives used to perform eye surgery, Accutome has grown into a manufacturer of diagnostic equipment as well as a distributor of a variety of ophthalmic products including surgical instruments, medications, office supplies and more. With B2B customers including hospitals, government facilities, MDs, ODs, surgery centers, teaching facilities and vet practices, Accutome needed a user-friendly eCommerce website that was fast and easy to operate both from a customer point of view and from an administrative standpoint. Prior to February of 2015, Accutome’s website was built on an open-source platform that had become outdated, difficult to use, and lacked in functionality. “Our previous website was complicated to update and administer unless you were well-versed in web development,” says Lydia Andruscavage, Marketing Coordinator at Accutome. Product descriptions and photos were difficult to add and update, and with customers always on-the-go, Accutome knew that in order to continue to grow and uphold its decades-long legacy of superior customer service, quality and innovation, it not only needed an upgraded eCommerce website, but one that integrated with its Exact Macola ERP. We’ve come a long way with our Nomad website. Customers have been telling us how great the website looks, and how easy it is to use. Through a strong relationship with partner organization Mayer Group, the team at Sniperdyne was able to gain a thorough understanding of Accutome's erpCommerce needs, and in February 2015, Accutome went live with Nomad erpCommerce. Almost immediately, the company began to notice significant increases in website sales. “As soon as we began working with Sniperdyne, we noticed a huge change,” says Lydia. Built to synchronize directly with any ERP, Nomad allowed Accutome to seamlessly integrate its product, customer and order information with its new eCommerce site to the benefit of customers and Accutome alike. “Customers have been telling us how great the website looks, and how easy it is to use,” says Lydia. Due to the ERP integration, rich product information from over 5,000 products pulled from the ERP is displayed on Accutome’s new eCommerce site, and when customers log in, they’re able to view only their individual customer pricing. With simpler navigation, customers can now more easily search, discover and order products. Website features that are especially popular with Accutome’s customers include the easy instrument search, a saved shopping list which tracks order history for quick re-order, and the Olark live chat feature which allows Accutome to continue to deliver superior customer service--however the customer chooses to communicate. The user-friendly admin interface has allowed Lydia to customize the look of Accutome’s site, to easily make changes to information, and add other features like a blog, news and social media sharing. The administration of the website is now only a fraction of Lydia’s duties--allowing her to perform other critical functions within the marketing department. Additionally, Accutome has taken advantage of Nomad’s metadata features and SEO capabilities, and now appears on the first page of Google in product searches. These efforts have resulted in a 50% increase of visitors from organic searches. “We’ve seen significant increases in website sales,” says Lydia. Since implementing Nomad erpCommerce, Accutome has experienced its best website sales month, and has increased overall website sales by 25%. Now with an upgraded, professional eCommerce website that integrates with the company’s ERP, Accutome has achieved an improved experience for the customer and the company alike. The company now looks to continue to increase sales through monthly promotions and continually growing and adding new product offerings. Seamless integration with ERP: Nomad is able to seamlessly “talk” to Accutome’s Exact Macola ERP, allowing the company to feature over 5,000 products--and continually add more--with less administration time. Optimized for complex pricing situations: Synchronization with Accutome’s ERP means that upon log-in, customers view only their individual customer pricing. User friendly design and marketing options: Accutome is able to easily update and change product info, images and look of the website including the addition of news, blogs and social media sharing. Improved customer experience: Accutome customers who are on-the-go and in between surgeries can quickly place orders and receive support with features like quick instrument search, shopping lists and live chat. Improved sales: Due to vastly improved SEO, rich product descriptions and ease-of-use, Accutome has experienced a 50% increase in web traffic and 25% increase in website sales.